Who are the leading companies in the nuclear waste management industry? What is their existing processing capacity and where is it based? What are their core strengths and weaknesses? Do they have expansion plans? What is driving and restraining the involvement of each leading company within the market? What are the Strengths, Weaknesses, Opportunities and Threats to the nuclear waste management market as a whole? What political, economic, environmental and technological factors affect the nuclear waste management market? This independent, 138-page report guarantees you will remain better informed than your competitors. 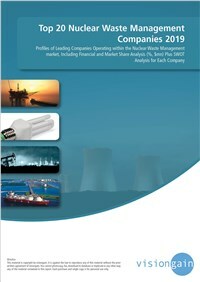 With 100 tables and figures examining the companies within the nuclear waste market space, the report gives you an immediate, one-stop breakdown of the leading nuclear waste management companies plus analysis and future outlooks, keeping your knowledge one step ahead of your rivals.